Okay, there is technically never a “Black Friday” Sale on real estate since most property is owned individually and not offered as a special. Black Friday is however, within the traditional seasonal downturn in real estate. Using Hillsborough County NH as example (see graph below) , even in an overall increasing market, there are peaks and valleys that are attributed to different seasons. 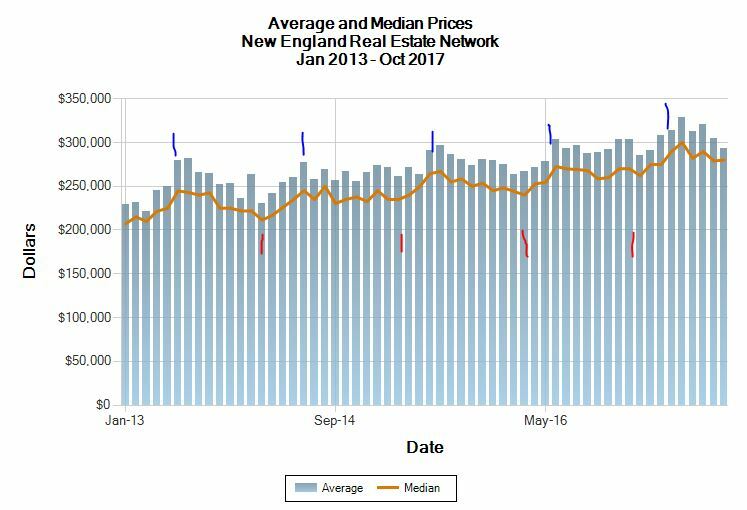 Whether your house is located in Manchester, NH, Bedford, Merrimack, Nashua or Concord, prices rise in the spring/early summer, stabilize in the late summer/early fall and decline in the late fall/winter. So how does this translate to Black Friday? Well, if you are truly looking for more affordable prices, considered looking at real estate during the busy holiday season. While others are shopping for TVs, you shop for real estate. Sellers are often more flexible since they know it may be months before the winter market “heats” up again. Keep in mind if you are order an appraisal (ore reviewing someone’s) whether it is for a divorce, estate, listing or sales purposes, the results can vary significantly as the opinion of value is as of an exact effective date.